A simple, safe and proven effective method of treatment that kills bacteria and other micro-organisms without chemicals and with no effect on taste, pH or chemistry in drinking and process water. SIMPLE - Electrical design does not require specialised knowledge in operation and maintenance. SAFE - No chemical hazards, minimal safety precautions, silent and environmentally friendly. EFFECTIVE - Over 99.9% kill rate. 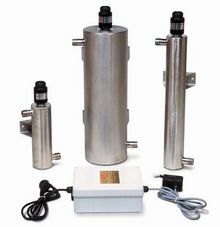 Also see our range of Residential Whole of House Defender UV filtration systems.